The good news is works very well. 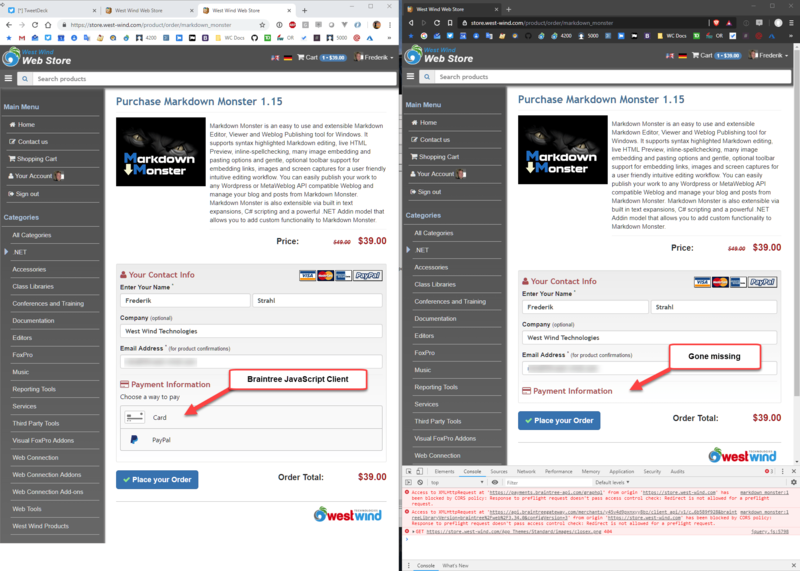 Order processing is very quick through this remote interface and with BrainTree at least as a bonus you can process PayPal requests just as you do Credit Cards using the exact same process with a different 'card type' - no need to use a separate PayPal order flow. Nice. But - and there's always a but - today I noticed a fairly major problem: For the last few months I've been using the Brave Browser for most of my Web browsing. Brave is a Chromium based browser that provides most of the features of Chrome without Google tracking you each step of your browsing adventures. Brave also provides built-in ad-blocking by default so overall the browsing experience out of box is much better than you get in stock Google Chrome, because a lot of the crap ad content that makes up a good part of the Web these days is not being loaded. When visiting one of the payment pages in my store with Brave, I noticed that the payment page wasn't working. Basically the remote payment form wasn't showing up. Notice that Brave doesn't render the payment form and if I open the DevTools I can see that it's failing because of CORS policy. My first thought is that something was wrong with BrainTree's CORS policy that they are pushing down to my site, because typically CORS errors are related to missing sites in the content policy and CORS headers that are returned from the target SDK server. But alas it turns out that the problem isn't really the CORS headers but rather the fact that Brave is blocking third party cookies. This is likely to be a problem with not just Brave Browser, but any content/ad blocker since third party cookies are a primary source of identity tracking. 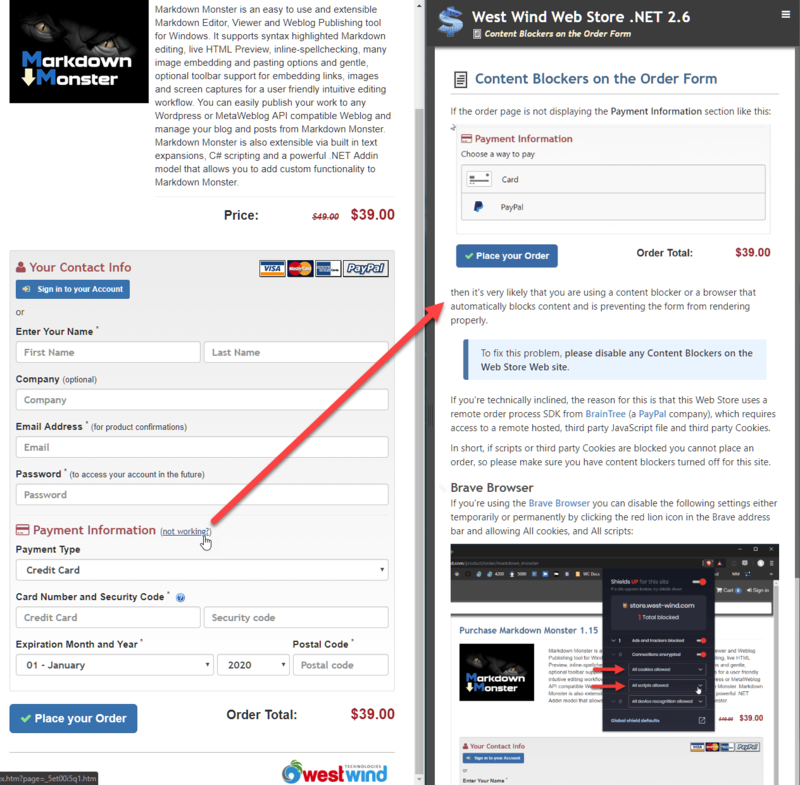 Unfortunately in this case the third party cookie is required for operation of the order form and not for tracking purposes. So, how to address this problem? I'm not sure if there's a real technical solution unless you want to fall back to server side processing which for security reasons is not a good idea. 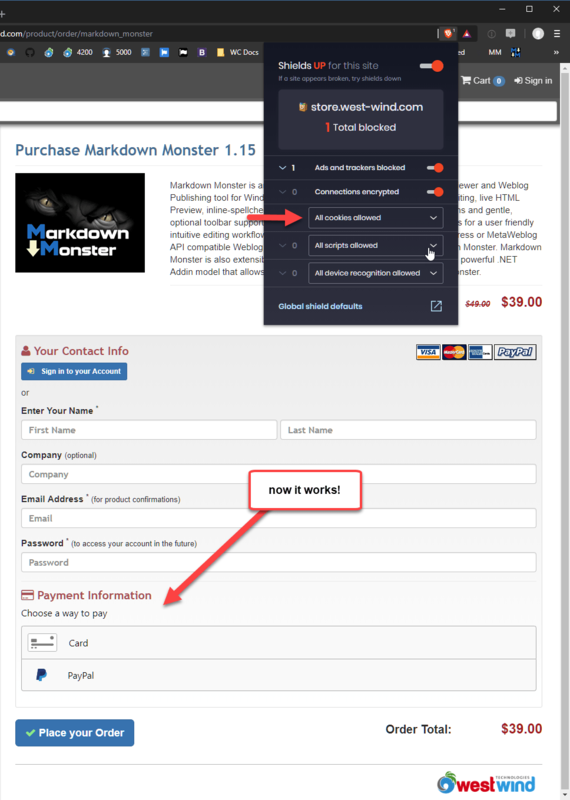 In my custom store I can actually process either server side or using the client form. But because of the PCI requirements and liabilities, falling back to the server side processing is simply not an option for me. However, this might be for a larger company that has gone through their own PCI certification. The only other solution I see is to provide some help to the user should they find themselves in this situation. I've added a link to the form that takes the user to a documentation page that describes what they should see and with some explanation on turning off content blockers. This is not very satisfying but hopefully it might help keep people who hit this problem on the site and get them to disable their content blockers. Ah - progress. By offloading payment processing to a remote service I've solved one thorny problem (PCI) and now I've potentially brought in another problem that might keep some customers from being able to place an order. It seems that no matter how you turn things with security, there is always some sort of trade off. If you're using a browser like Brave you are probably fairly technically savy. It's also very likely that you will eventually run into problems like this with other sites. These days there is so much integration between applications using APIs that require remote scripts and third party cookie integrations and content blockers likely will become a more common problem for users in that more and more legitimate content will end up getting blocked. This whitelisting takes a little work, but it's usually still better than the alternative of getting flooded with ads and trackers. The hard part is realizing that it's happening. In using Brave I often simply forget that it's blocking stuff and when stuff fails my first reaction is that Brave is not doing the right thing, when really it's the content blocker. For less savvy users this is especially the case since they have no idea why a page doesn't work right and thinking of turning the content blocking off won't come natural. Heck it didn't come as the first thought to me - I googled CORS issues with BrainTree initially, before trying a different browser 😃. Hi, if you're really crazy you could try to diagnose this syndrome, say you register your own 3rd-party site, e.g. dummythirdparty.com, and have it serve up say a 1x1 pixel element and a cookie or two on a pre-payment check page or frame. Then in a script you could detect if that 1x1 element was rendered or not. 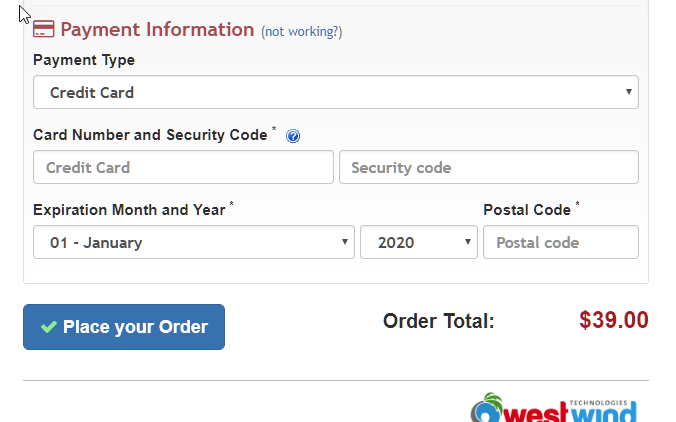 If it was, then proceed to the payment page, else display some message. @Henry - yeah that sounds like it would work to see if things are blocked. It's a bummer though that BrainTree couldn't figure this out on their end. They should be able to send a request with a cookie as part of the startup and see if the cookie makes it - if it doesn't then they should fail and display a message in their UI which probably would be a better way to go. But given the way it fails - with the CORS error - maybe it never gets that far. I have to spend more time with it to see what they are doing.